Retrospec... what the heck is that? This has probably been a really long time coming, so better late than never. 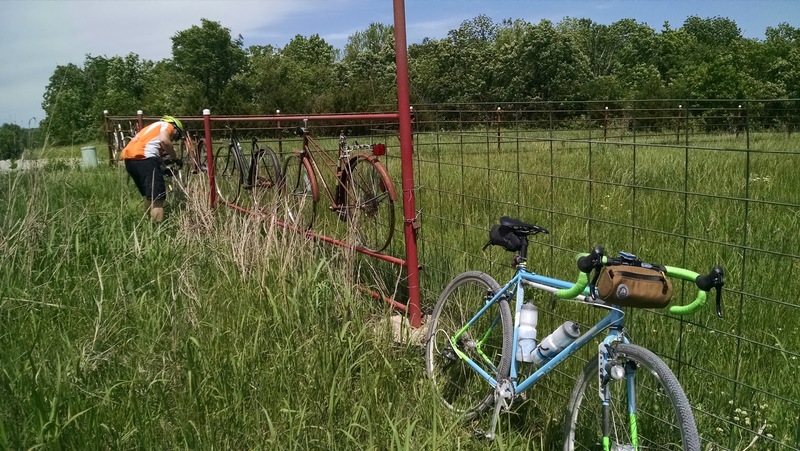 A few years back I had some Dirty Kanza aspirations, but no bike. 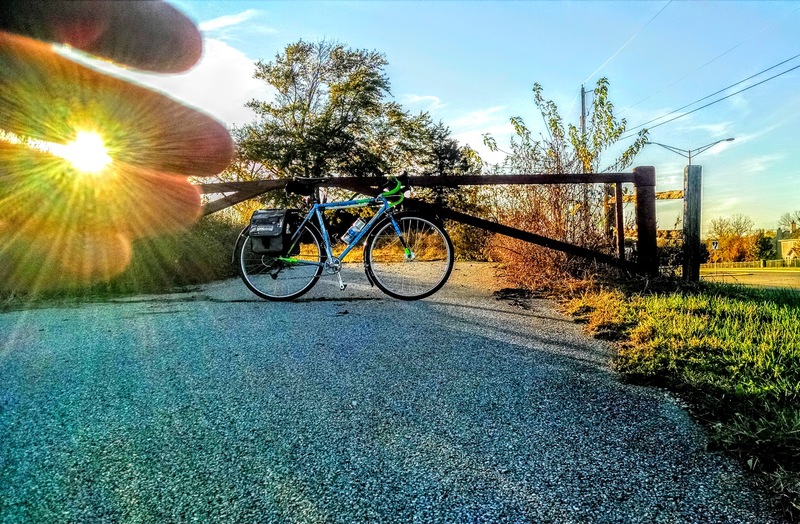 Alas, I've been ever fond of the concept of under-biking ... the smile on my face in some of the photos from that post are clear indication that pavement isn't "everything", and even recently this post has been mentioned and re mentioned in social media. 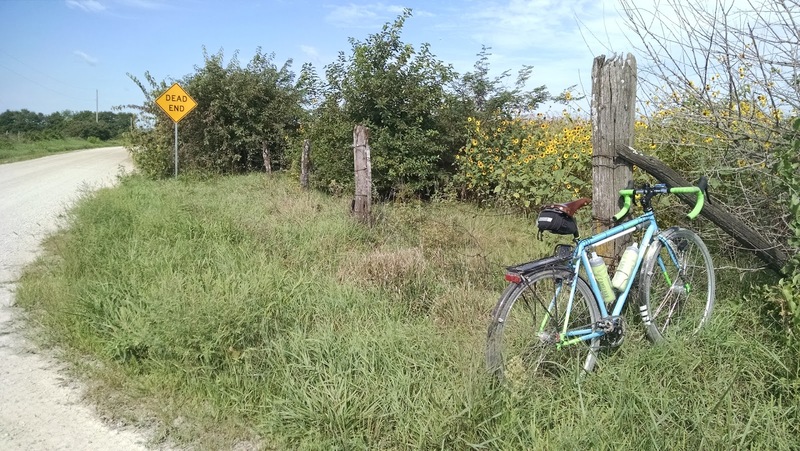 It had a profound impact on me, and very, very few of my personal rides on the road bike don't involve at least a little gravel or light off-road. But, DK demanded a bit more respect and attention... at least, more tire volume and mud clearance than my traditional road bike allowed. Keeping with the advice of The Dirt Bum, our sage guide for the post mentioned above and purveyor of all things that make good sense, I sought out a low-cost entry into the world of gravel bikes by way of a tip on Amazon.com about the brand "Retrospec", and specifically their model called the AMOK, now on version 2.0: a basic, no-frills cyclocross bike with the clearances and rugged simplicity an event like DK seemed to demand. The local garage sale scene would have also been a great place to start, but, at the time and the price -- which was (for whatever reason) FAR lower at the time of my purchase than Amazon lists today - it was hard to ignore the value. Essentially, I was getting a 4130 CroMo 'cross bike for far less than I could have likely cobbled together on my own. Done. That was April of 2015. In short, it's all been money well spent, even if only for the frame-set. The frame is solid, stiff, responsive, predictable, and yes, probably a lot heavier than it need be; but, it feels and looks purposeful. It certainly doesn't feel "cheap", which is an indication that a lot of price-point bikes (save for weight and tech) have come a long way in the last decade. Wheels, however -- one gets what they pay for. Considering my investment, the wheels could have been in pieces when shipped and I would have been happy. 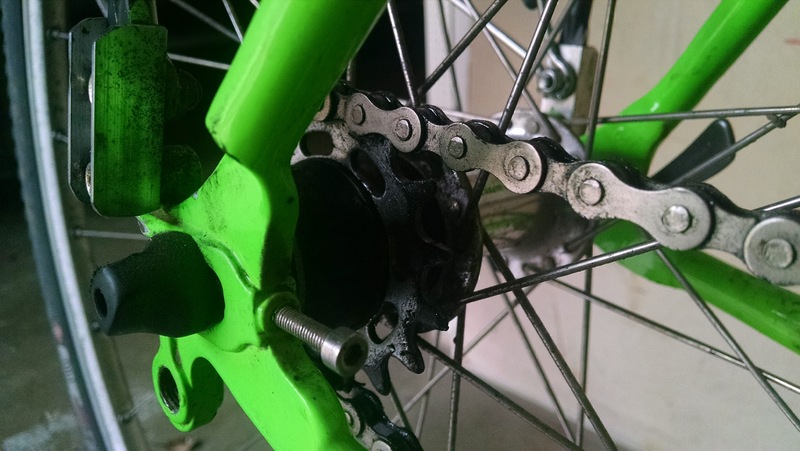 Overall, this is usually where off-the-peg bikes tend to suffer most; likely the reason the best money one can ever spend toward the upgrade of an existing bicycle is toward a wheel set. The hubs are house-branded - loose ball bearings with retainers and poorly-designed seals which either drag too much or let too much water and dust into the hub body - take your pick. The spokes are straight-gauge, traditional J-bend at the hub flanges, and the rims are no-name with a semi-aero profile, about 23mm wide, to allow easy adaptation of larger tires. However, they ultimately proved their price-point: after a few thousand miles, the rear drive side spokes (which were laced only 2x instead of my preferred 3x) began to let go, around the same time the hubs began to demonstrate knocking and wear. After a few rebuilds and replacement of spokes to little avail, they've since been retired. Initially I'd been using them as backup wheels for the studded tires I'd bought - finally once again having a frame which would accept big, meaty, studded winter tires for commuting. 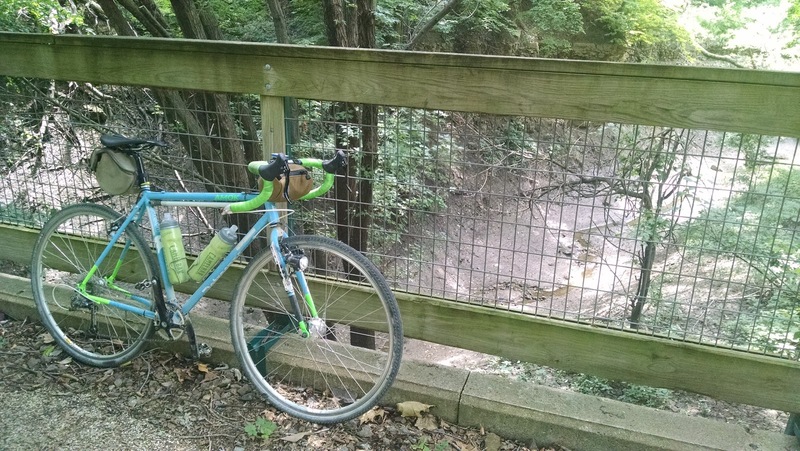 For daily riding, and many of the gravel brevets I've enjoyed atop this bike, I'd adopted my old standby road wheels for the job - a generator hub up front (because it's me.) and an older Shimano Ultegra hub in back, laced 3x to Mavic Open Pro rims. 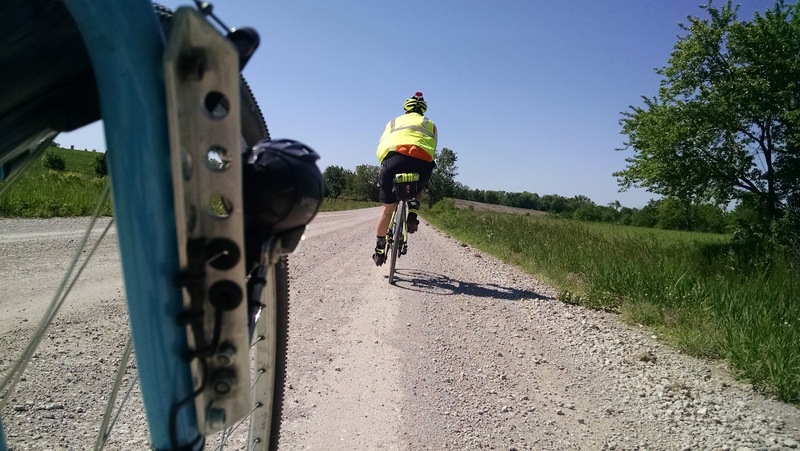 This is the part where the forum posts go wild -- yes, I'm probably 12 kinds of crazy and stupid for running such a "spindly", "roadie" wheelset for gravel... but, c'mon. I'll allow you to exercise the "I told you so" if I ever end up dead in a ditch because of my wheel choice - but, again: it's me. #1, they are in the garage already... and #2, seriously, if I could even approach affording Chris King or HED or anything else "bomb" for my rides, I probably wouldn't have picked an Amazon.com bicycle purchase in the first place, right? Right. Let's keep this real. The only real takeaway here: buyer beware with wheelsets supplied with ANY complete bicycle purchase, unless you are shopping the top 10% of available bikes. If you reach a certain price point, the included wheelset is likely something pretty special... but, if you don't see names you recognize on the rim and hubs... sock away some cash for a future upgrade. This is where the internet trading market is terrific: finding anything with a Shimano logo, Sun rims or Mavic, Alex or similar, will usually yield a better platform than most no-name wheels out there. My Ultegra hub, now in daily duty on the Retrospec, is approaching 40,000 miles of trouble-free service, compared to the couple of thousand I got out of these "house label" wheels before the problems began. Most folks buying this sort of bike, fairly, may never exceed 3000 miles in the bike's lifetime... so, they are equipped appropriately. Tires: Having nothing to compare to, the included Kenda Small Block Eight 'cross/gravel tires (in 700x35) were pretty darn good - albeit noticably slower then the road tires I've been used to: that was fully expected. 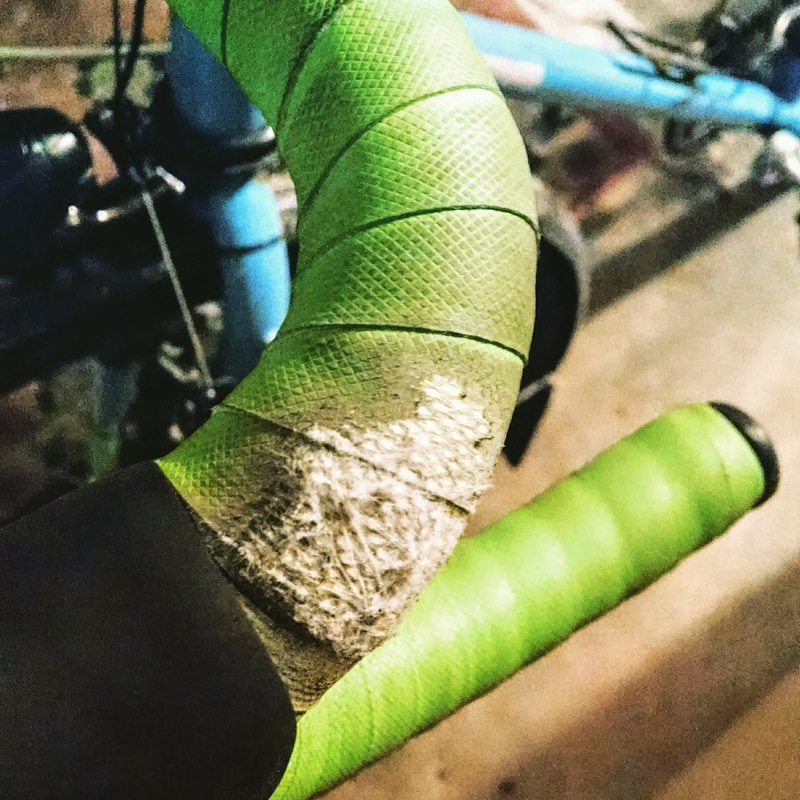 It wasn't until I finally burned through the tread and changed to the "Trigger" model from Specialized that the comparable flaws in the Kenda became apparent. It was hard to ignore the Specialized's improvements in rolling resistance and comfort, even in a slightly smaller 700x33 size (though Specialized sizes, compared to other industry players tend to run bigger than the sidewall indicates). Currently I'm maximizing frame clearances and running the Specialized Trigger in a 700x38mm size... again, the forums will ignite with cautions about running a wider tire on a narrow road rim, and of these concerns I am fully aware - but, I'm also intending an eventual wheel rebuild before too much longer, likely switching from the current Open Pros to Mavic's wider and stronger A719 rims. Yeah, I still don't run disc brakes... It's not a political thing, it's a frame thing. The stock headset was "okay", but quickly started to pit - partly expected from another one of the no-name parts included in the build. Since - again - the initial value was so high with this purchase, it was easy to justify the $30 or so for a FSA "Pig" DH headset with roller bearings. WAY overkill for my purposes, but hey -- I like it when I can pre-load a headset and not have to touch it again. Ever. I generally classify headsets in the "buy it once" column, and prices for really good ones have come down in recent years. On that note, I'd opted - as a bit of a builder - to order the Retrospec as a single-speed configuration, after confirming they simply used the same cassette rear wheel as their multi-speed offerings, but equipped with spacers and a single cog, sans-derailleur. This gave me the flexibility to spec my own rear derailleur and cassette and give myself a bit of an upgrade out of the gate. For these I chose the venerable Shimano Deore mountain/touring long-cage rear mech, which has a massive wrap-up to handle big cassettes (granted, I'm still running in the 9-speed range so... this keeps it cheap.) I opted for a 11-34 rear cluster, giving a lot of gear range for my desired 1x9 set-up --- although, I'd end up experimenting a LOT with front chainrings over the 24 months since my purchase. After running a paranoid-of-climbs 34t front ring (and finding myself in the 11t out back all the time), I moved slowly up through 36t, then 39, and finally landed on 40t being my Goldilocks chainring. With good chainline in the cruising gear and more climbing gears than speed gears, things are just about perfect now. I've made some other small changes here and there - namely swapping out the supplied handlebars for some of my fave Soma Hwy One road bars. The supplied canti brakes have been upgraded to Tektro's CR710 model, which have worked out nicely - offering better modulation and adjust-ability compared to stock. The stock saddle was (as most stock saddles) wretched and made from nails and evil... so I swapped on a Brooks C-17, and life is amazing again. Yep, again, it's "me" - so mild upgrades here and there over time are all part of the plan. 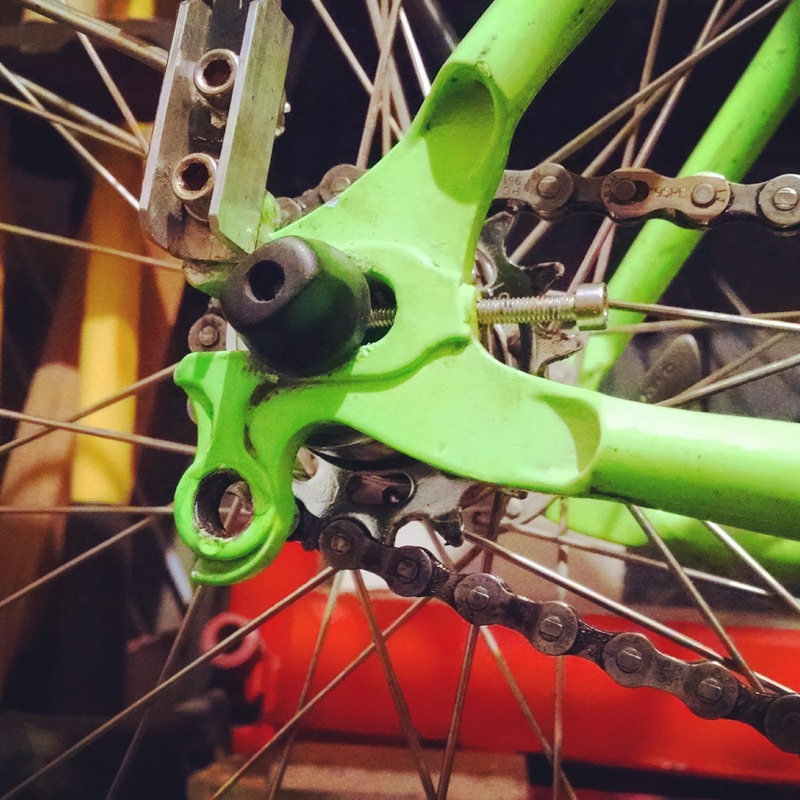 Start with a good backbone, and you'll get a great bike. As far as bikes go, this one has proven out as one of the most versatile I've ever owned. The geometry is very comfortable, and I could easily swap in my regular road wheels and tires and ride a 400km tomorrow without many gripes. I have a problem with multiple bikes in my stable... see the upgrades above, and you'll understand. I like a single bike, one chain to lube, on set of tires, one saddle, one set of measurements... so, getting this bike as comfortable as the Kogswell - which has been the sole bike for a long time - was paramount; but, now that I'm there I am finding things that this bike does better than my road bike... and so, fleeting notions about making THIS the sole bike have come and gone. Instead, I've used it as an opportunity to keep miles off the "good bike" and use this as the jack-of-all-rides that aren't brevets. I've ridden rail trail, paved trail, have commuted, have ridden gravel at distances up to 200km so far, and lots of stuff in between. Further, because it's heavier and obviously has higher rolling resistance, when I do ultimately jump back on the road bike, it feels light, quick, responsive, and fast.... and it's really none of those things compared to modern race bikes. I'm not sure it's supposed to be - but, the Retrospec has provided a terrific training platform and has removed a lot of barriers to some great riding, be they snow, gravel, mud, dirt, single-track, and more. Other suggestions -- any old road bike will do. A lot of 70's and 80's road bikes have terrific all-road geometries, and few realized their full potential. 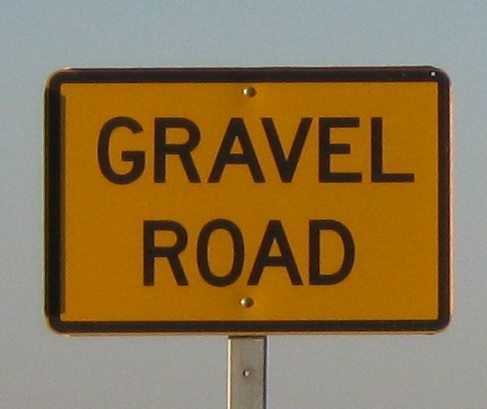 With loads of tire clearance, one can (again, see Dirt Bum's site) come up with a great gravel solution. But, there are solutions like the Retrospec which can fit the bill, too. Yeah, it's no Specialized, Trek, Scott, Ridley, or Canyon.... but, you don't have to let a tight budget stifle gravel road enjoyment or all-road adventure. Just know, while you should always support your local bike shop, there are options available to help you get out there now, getting dusty and putting a smile on your face. Enjoy! 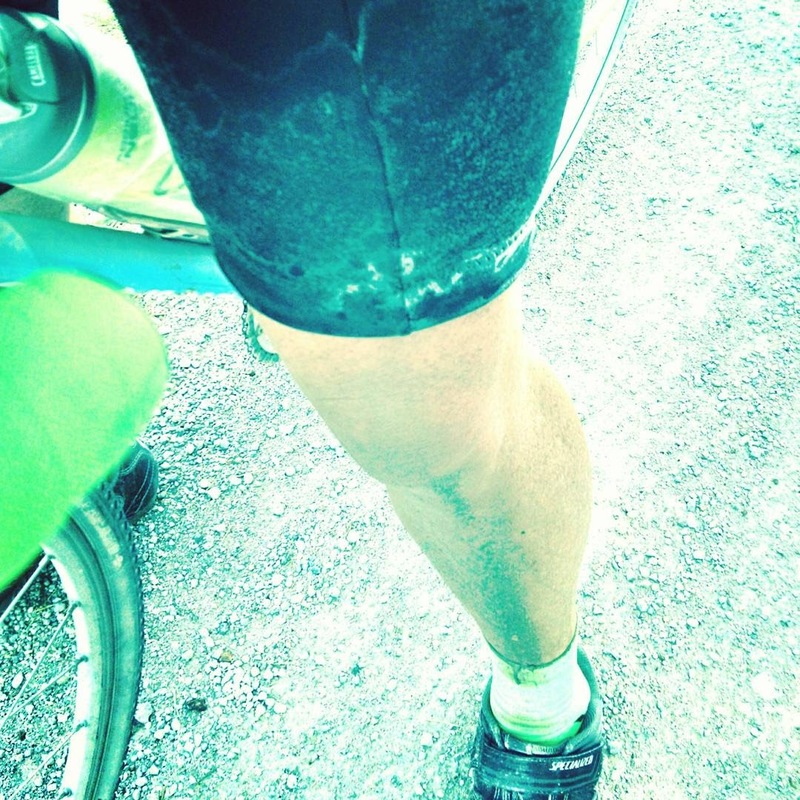 Last year on a particularly hot and brutal gravel 200km ride. Enough salty, sweaty brine to ruin a pair of bike shorts, but the Retrospec did great and got me home. 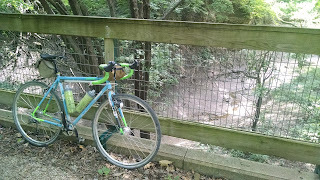 Before adding the rear derailleur, I enjoyed a few hundred miles on the stock single speed arrangement. Note the highly-versatile rear-facing, long horizontal dropouts with position-adjusting bolts/chain tensioners and derailleur hanger. Importantly, the dropouts are thick, the welds and tube joints are consistent and clean, and the entire frame is straight and tracks well. Yeah, I tried that leather saddle on this bike, too. I guess I'm just not a leather saddle guy, after thousands of miles of trying. Here, as commuting duty became more of the focus, the fenders and rear rack were added, as well as the rear generator light. Rear rack riser in view here, made from some aluminum stock. 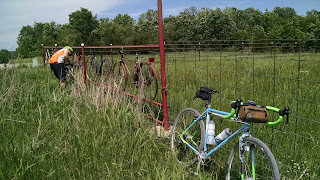 On the Flint Hills Nature Trail, enjoying some miles fender and rack-free. 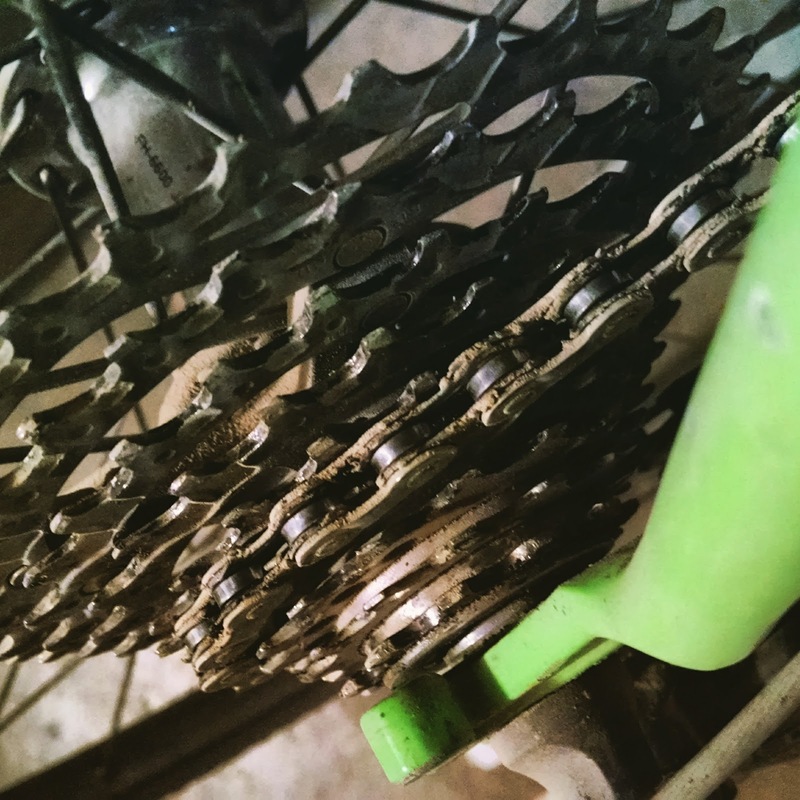 A wide range cassette to smooth out the sharper gravel road climbs out there. Don't be afraid of this sign... it's where the fun starts! Taking a break on a gravel metric century last summer. Generator light mounted on the fork blade with some aluminum stock, to keep it out of the streak of tire debris; Josh on point as we rack up the dusty miles. Approaching sundown on the evening commute home from work. 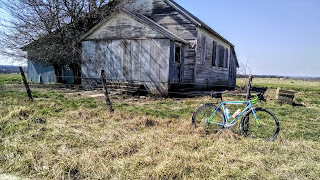 Gravel road exploration yields some of the best scenery and old buildings. Stormy weather? Just ride... it can take it.